It is that magical time of year again when baby wildlife are born and hatched. We often stumble upon these cute critters when we are outside enjoying nature. 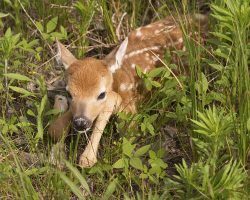 If you find baby wildlife, they should be observed only and not handled or “rescued.” They may appear to be alone, but you can rest assured that the mother (and in some cases the father too) are not far away waiting for you to leave so they can go back to caring for their young. It’s often possible to reunite the young with their parents by placing the baby directly in the nest or den, or in a box close to where it was found. If a bird nest has been destroyed, an artificial nest can be created and placed near the original nest. Young birds spend a lot of time hopping around awkwardly as they learn to fly. This behavior can make an observer think that the bird has a broken wing or has fallen out of the nest, but it is a crucial step in development. If you find a baby bird in your yard and are afraid that it will be hurt, clear the area until the parents can return to their fledgling. Contrary to a popular myth, birds will not abandon their young if they detect human scent. Both fawns and baby cottontails are left alone for most of the day and night, and are only fed two or three times during the day. A youngster alone doesn’t always mean it is an orphan. Occasionally, an animal may actually be sick or injured. Don’t try to rescue wildlife yourself, especially those that appear ill. If you find an animal, make sure it is actually in trouble. Looks for signs of injury or listlessness. Then contact your city or county animal control staff or local wildlife rehabilitator for advice. If you must intervene, keep the animal in a secure container lined with clothing and place it in a warm, dark, quiet place. Do not attempt to feed or water it. Injured wild animals in captivity may strike out from fear and pain. With few exceptions, all wildlife in Iowa are protected and federal and/or state permits are required to rehabilitate injured animals. Looking for activities that correlate to keeping wildlife wild?